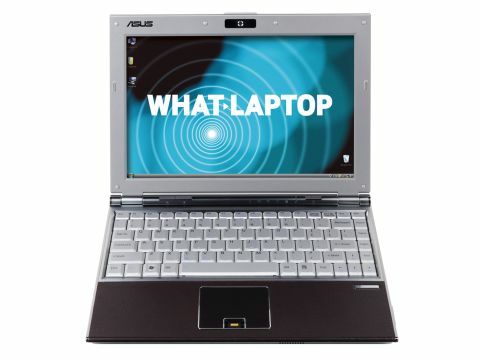 The Asus U6 (£1499 inc. VAT) is one of the most distinctive laptops around, with leather palm rests, a metallic brown lid and smart silver touches. The display is a 13.3-inch panel. It uses LED backlighting to offer bright and accurate colours. As with other Super-TFT displays, it reflects in brighter conditions, but we never found it to be a problem. Images were sharp, and there's plenty of space for opening two documents side by side or for watching movies. Perhaps surprisingly for such a compact machine, the Asus packs a dedicated graphics card into its chassis. It's an entry-level GPU - Nvidia's GeForce 8400M G adapter. You'll be able to edit videos or run multimedia presentations with ease, or even play the odd game. However, it doesn't help mobility; with the standard battery in place, the U6 lasted for just 60 minutes, under test. You'll get around double this with the extended battery, which is included in the price but is rather large and unwieldy. The keyboard is broad and comfortable, and offers an accurate typing action. It's easy to type quickly, as the main keys are full-sized. Some of the peripheral keys are slightly smaller, but this didn't slow down typing speeds. The Asus is a well-made machine. Quality materials are used in its construction, and the leather palm rests were tactile and comfortable. Perhaps the most impressive aspect of this machine, considering its size and dedicated graphics card, is how cool it remained to the touch. There was a small degree of heat to the left of the touchpad, but most of the machine remained cool even after long periods of use. The SIM card for the 3G/HSDPA adapter is accessed by removing the battery. As is standard, the antenna for the module is integrated into the machine itself. The U6 uses Asus' own 3G Watcher software, which we found simple to use, and is network provider neutral. Our test machine came with 1024MB of memory, but those on sale will feature 2048MB. The U6 also boasts a decent processor in the group. With Intel's 2.4GHz Core 2 Duo T7700 processor in place, our benchmarks were dispatched with ease, and the U6 proved equally adept in day-to-day use. The 160GB hard drive offers plenty of space for all your work, photos and movie files. Apart from boasting style and comfort in abundance, the Asus U6 offers an almost unmatched mix of portability, power and features.